Winters in India are cold, heavy and damp. It brings with it an ironic feeling, where with one heart winter is welcomed after the scratching October heat, with the other heart it is cursed for bringing with it the viral fever. 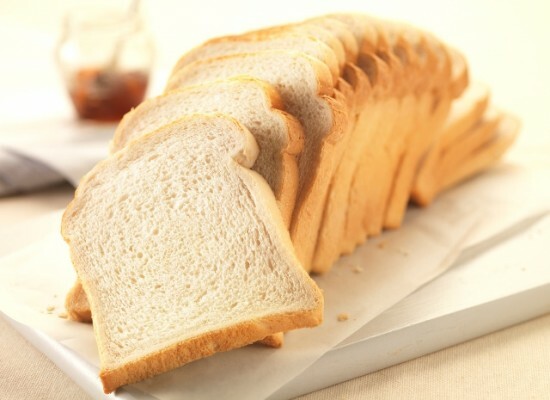 But the most important thing-to-do in this winter season is have a proper winter diet. All of us need some winter hacks because the only eatable winter foods otherwise is Spinach, dry fruits and green tea! Here are few of the winter food hacks, both important as well as delicious ones that would lead you to a warm, happy and safe winter. 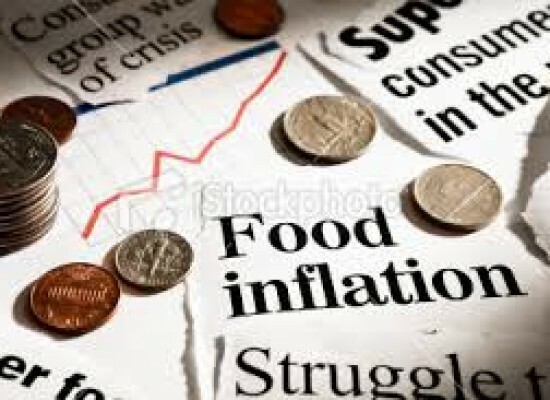 Food that is not only tasty, but also safe to be eaten in this season, simply because you cannot afford to fall sick every time. This is a time, when we need to follow certain rules to prevent ourselves from being sick and also go against the rules(sometimes) to enjoy the cold weather with a hot and spicy way. 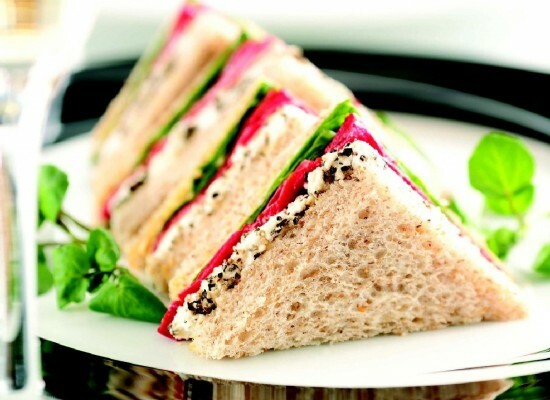 But there is a routine that should be followed every day to stay fit so that you can have a taste of delicacies as well. 1. Have a glass of warm water the first thing you wake up in the morning, to stimulate a healthy bowel movement. 2. If you have tea, it should comprise of ginger, clove and cinnamon and herbs to keep you away from sore throat. 3. Lunch must include Steamed vegetables, warm soup with ghee and whole wheat unyeasted bread. 4. And the dinner should be done early to ensure proper metabolism. Your daily diet must include leafy vegetables, cut them, eat them raw, fry them or make a delicious recipe. But one leafy vegetable every day is the must-have in winters. Also, eat lot of dry-fruits; it will keep the body warm, against the cold weather outside. These are the daily must-follow hacks for the season. 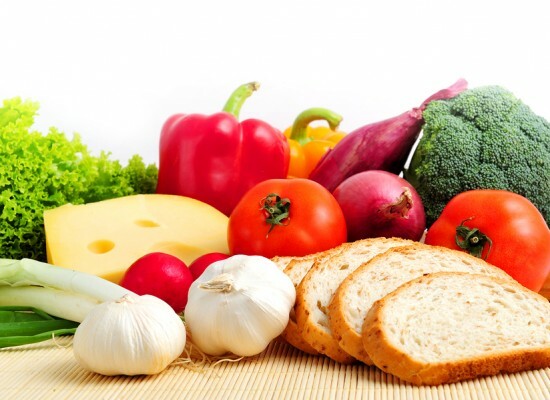 But the body craves for tasty and zesty food. 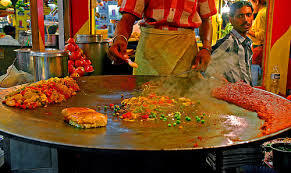 The street food and sweets and all the lip-smacking dishes are the most desired. 1. 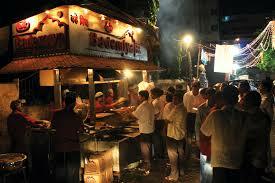 The Kebab’s at Bade Miyan (Mumbai): On the coast of the sea, in every heart of the city lies this delicious eatery. Bade Miyaan is famous for its Biryaani’s and Kebabs. When you are cold, experience the mutton-roll of this roadside eatery near Colaba Causeway. 2. 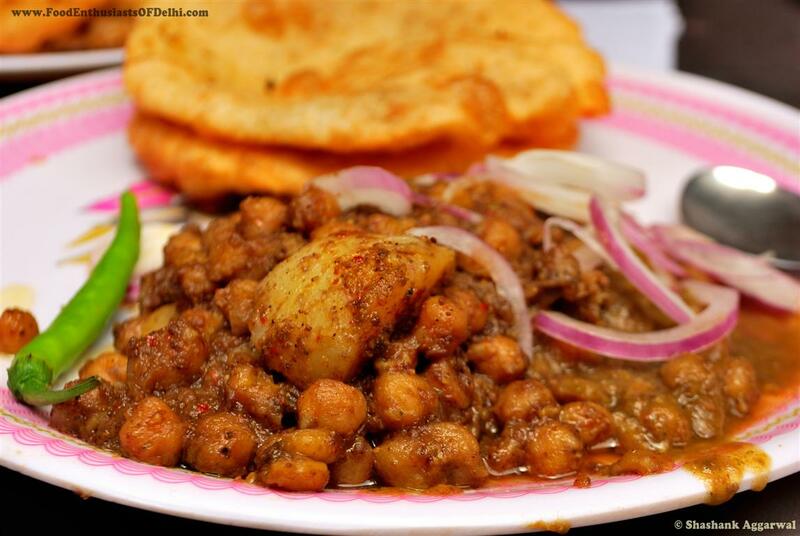 Chole Bhature in Delhi: The best place to have street-food is the capital of the country! Chole-bhature along with rajma-chawal and parathe are the most eaten breakfast and lunch dishes here, which makes it very famous in the other urban cities of India as well. 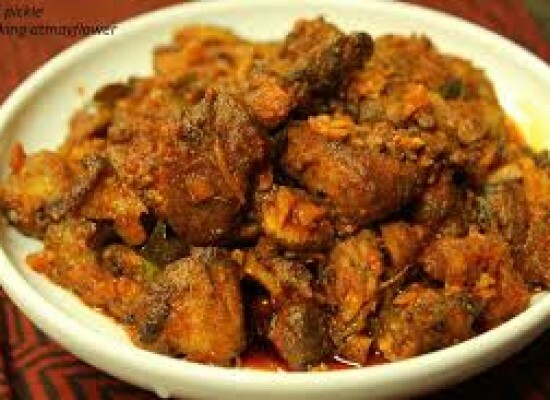 Drool in when you are cold and enjoy this steaming and spicy treat in the city! 3. 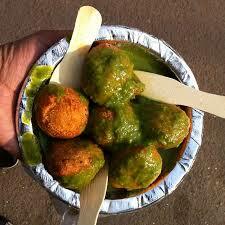 Ram Ladoos in Alkanand Market in Delhi: Crunchy, tasty, fluffy laddoos in the market served with tasty green chutney is a great treat to beat the coolness. Enjoy it with the spicy chutney in Delhi. 4. Pav Bhaji in Mumbai: Come to Mumbai and not have the street Pav Bhaji is a very bad decision. This spiced dish along with the zesty tawa pulav will evaporate the cold off anyone. 5. 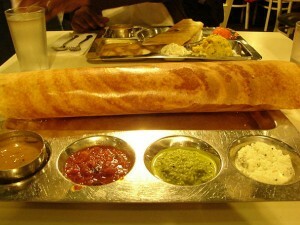 Idli-Sambhar-Dosa in Bangalore: Bangalore has always been famous for its cool weather. The days are cold and the nights even colder. Taking a walk on Bangalore streets in the nights would almost freeze you, but there is one aspect that never goes missing, the amazing dosa stalls on Bangalore streets that are open in the night and serve hot food to blow away the cold. 6. 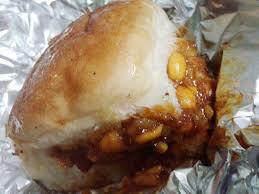 Dabeli in Ahmedabad: A fabulous roadside chat, very famous in Mumbai and Pune, originated in the Kutch, Gujarat. 7. 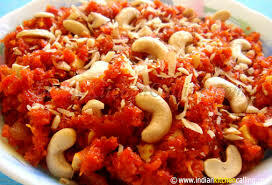 Gajar ka Halwa with Dry fruits: Mostly made in Rajasthan, as their winter delicacy. 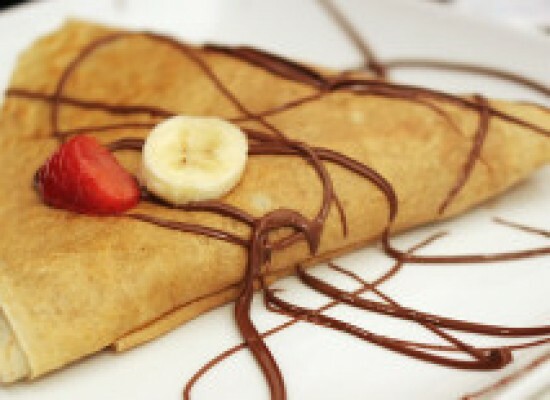 Easy-to-make, mouth-watering sweet. Add it up with dry fruits, isn’t it a tasty and healthy way to beat the winter? 8. 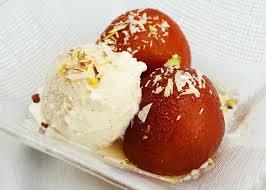 Hot Gulab Jamuns: Hot gulab jamuns with ice cream is a treat on wintry nights. 9. 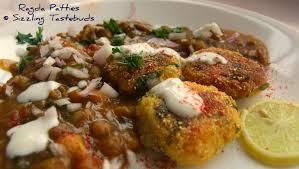 Mirchi Bhaji and Ragda Pattice: The favourite chat in almost all the cities- Bangalore, Mumbai, Pune, etc. that has its origin in Hyderabad. 10. Chai Pakora: Think of Cold, think of rain and one thing you would always picturize is having a hot cup of tea with onion and potato pakoras! A treat to self if you have a good book to go with it. 11. 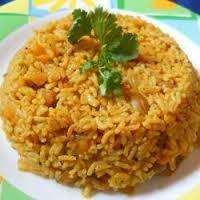 Masala Khichdi : A traditional, light weighted meal to keep you healthy. 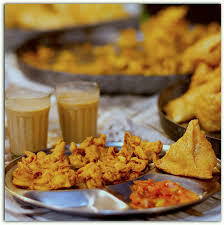 Winters are enjoyable when you take care of yourself, follow a proper diet. Cheating the diet once in a while is always permissible. Make lot of use of fruits, vegetables, ginger, cinnamon, leafy vegetables, sesame oil and dry fruits in your diet to keep you active and going fit throughout the season.